I just released my new modellingSuite and I would like to share it with the cg talk users. 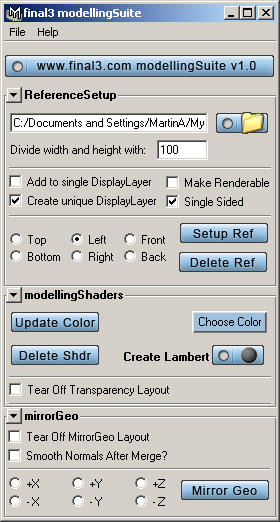 –> It will build shaders you can model with and also build a transparency control for the shaders. time so I wanted to create my own layout for it and I included an option to smooth normals there. In later versions other mirror tools will be there. There are some videos avaliable for download that shows you what the script can do. There is also a video explaining how you use the suite to source the scripts you want to use. Please use this thread or my contact form for suggestions or bug reports. I am working on the script for next version already, but all kinds of feedback are appreciated. It’s spelled “modeling” and “modeled” in US I think… and with two L’s in britain I guess. But hey… we’re from norway… what do we know. Next time go “modelleringsShader” mika. hi …thinking of sending you an update and i just caught this…the spelling thing reminds me of a thread last fall…started out about how to spell modeler for someone’s resume…ended up about 70 posts later about beer in belgium…i was of course avoiding my math at the time as i am doing right now…ah, yes the semester has begun and i have my first exam in two days! but, did some Maya over the past week and will be in touch with you as the semester progresses! amannin: The spelling could be changed if it annoys people British people drive on the wrong side of the road too When you say the page doesn’t load correctly, do you mean the entire page or just if you click the links? And have you tried right click- save target as? yashu: Thanks yashu. The modellingShader is the script that will go through a facelift first. A very clever idea I’ll look into that. ah, you were talking about the setup reference? it would be much better (at least for me :D) to make the reference planes have a consistent color (in the viewport) instead of a lambertian shading model. Do you think you can stick with lamberts for a month? thanks for the input man. People have so much trouble with image planes. I don’t understand how people can still use them!?.. Hah, said the American using the bastardized US English. You guys need to adapt to British English and the Metric System already! So I created a torrent file and I encourage those of you who actually downloaded the video to also download the torrent and help me host it.